Summary: Adam Austin hasn't spoken to his brother in years. When they were teenagers, their sister was abducted and murdered, and their devastated family never recovered. Now Adam keeps to himself, scraping by as a bail bondsman, working so close to the town's criminal fringes that he sometimes seems a part of them. Just before playoffs begin, the town and the team are thrown into shock when horrifically, impossibly, another teenage girl is found murdered. When details emerge that connect the crime to the Austin brothers, the two are forced to unite to stop a killer-and to confront their buried rage and grief before history repeats itself again. It's not secret to those of you who follow my blog that I'm a big fan of Michael Koryta. I have read his last few books which all combine mystery with the supernatural (I know... not my usual favorite genre), and I have enjoyed all of them a great deal. 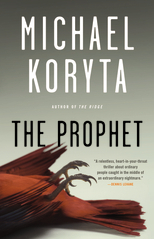 So when I learned that his latest novel THE PROPHET was just a pure stand-alone mystery, I admit that I was even more excited than usual for a Koryta novel. And then, when I saw the book described as a "Friday Night Lights meets In Cold Blood" by Kirkus, I absolutely couldn't wait to read it. Usually I would have featured my review of THE PROPHET as part of Mystery Mondays, but I enjoyed it so much that I didn't want to wait! I thought this novel was fantastic and I just flew through it in less than a 24 hour period. I am a huge football fan (and loved the book FRIDAY NIGHT LIGHTS), and as you already know, I'm a big mystery fan too, so this book combined two of my favorite things. When you add that Mr. Koryta also has major writing skills and even delved into a very complex relationship between two brothers, it all makes for a great story. THE PROPHET tells the story of Adam and Kent Austin, two estranged brothers who have taken very separate paths in life after the disappearance and murder of their sister. Adam is a bail bondsman (who also happens to have his PI license) while Kent is the much-revered high school football coach in a town where football is king. Adam is a bit of a lost soul because he can't deal with the guilt from his sister's death, while Kent is a deeply religious family man who seemingly has it all. When a young girl comes to Adam (by way of Kent) and asks for help in tracking down her father who has been recently released from prison, Adam has no issue in providing her with the information. However, when she is found murdered shortly thereafter, he find himself involved in the murder investigation. Actually, both brothers find themselves smack dab in the middle of the investigation. These two estranged brothers (who are each dealing with a huge amount of guilt) decide to pull together to stop the killer and protect those they love. Along the way, they also begin to see not each other, but also themselves, in a new light. I am just so happy that Michael Koryta returned to pure crime after trying his hand (rather successfully) at supernatural thrillers. While I did appreciate his last few books, I think this is where he belongs -- writing crime novels. While the mystery aspect and surprise ending were very, very good, I think there were two main reasons that I appreciated THE PROPHET so much. First of all, I loved how this book explored the life of high school football; and I'd be lying if I didn't say how much it did remind of the book FRIDAY NIGHT LIGHTS. The story takes place in a small Ohio town that has seem its better days. Quite frankly, the only thing this town has to be excited about is its high school football team's chances to win a State Championship. Mr. Koryta managed to capture the essence of this small town perfectly as well as its optimism for some sense of hope (even if that meant a big win for the football team.) I know I'm a football geek and not all readers will enjoy this, but I also liked all of the "football talk" and descriptions of the plays. Another fantastic aspect of this novel was how it featured the relationship between Adam and Kent. These men had, without a doubt, very different personalities; and as a result, chose very different paths in their lives; however, they still had the bonds of brotherhood as well as the loss of their sister. I loved how, despite their history, they were able to pull together for a common goal; and I also appreciated how much each one wanted to protect the other. I definitely wasn't expecting this, but I was deeply touched by the way their relationship evolved and how much they loved the other. This might surprise you, but I think THE PROPHET would make a great book club selection. In my opinion, it really is a literary mystery and deals with some universal themes about love and loss. I wasn't able to find a formal discussion guide, but you really don't need one. Some of the themes you might want to explore include family, brotherhood, faith, redemption, revenge, love, pressure, responsibility, sacrifice, and guilt. Overall, I highly recommend THE PROPHET. It's a great mystery with some nice twists near the end, but it's also a wonderful look at brotherly love. Michael Koryta has done it again! I've never one of Koryta's pure mystery books and I'm really looking forward to this one. You know me and football. Kathy sent me this book, and it is next up, after I finish my last two graphic novels of The Stand. I love his books, even when they DO have supernatural in them, and my bread and butter is mystery, so I am JACKED. I think he is going to be at SIBA, so I need to show up prepared. So I can yet again make a total fool of myself if I get to talk to him. I had to just skim your review -- I have this onboard for this month's reading. Sandy introduced me to this author, and I was so impressed. Obviously I need to read this one as well!